Opening reception November 1, 1:30 - 3:30 p.m.
Los Angeles artist Chenhung Chen’s fascination with line continues in “Crossings”, a solo show at Crafton Hills College Art Gallery, opening October 27th. 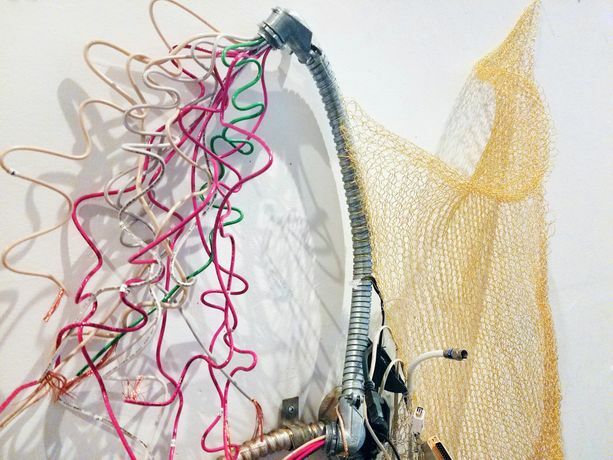 Chen’s installation includes work from her Entelechy series of sculpture created from reclaimed electronic parts and cabling along with new work of drawings using staples to release line from the flat dimension of paper. Taiwanese-born Chen first recognized the power of line in Chinese calligraphy and painting and, later, in American Abstract Expressionism. For Chen, line expresses delicacy, power, buoyancy, strength and constant motion. In “Crossings” line has been released from its two dimensional existence and is expressed as a three dimensional painting. Delicate ying crochet wire sculptures intertwined with yang spines of cabling and electronic and computer components float over drawings made from staples that appear to reach for the sculptures overhead. The connection between grounded drawings and the sculpted pieces alight in the air signal the dichotomy of our existence: frailty and strength, good and evil, love and disinterest.